UPDATE: John’s new book “Operation Ruby Slipper” has been delayed and will be released in September, 2011. John Meyer is the author of the bestselling 1983 memoir Heartbreaker (Doubleday), republished in 2006 by Citadel Press, in which he recounts his experience with Judy Garland towards the end of her life. Meyer is also a composer of songs, including “I’d Like to Hate Myself in the Morning” and “It’s All for You,” both performed by Judy, and which are available on Meyer’s new CD, Bringin’ Out the Beast: Songs by John Meyer. Author of the forthcoming novel Operation Ruby Slipper, an e-book available for download on August 15, 2011, Meyer here answers a few questions about his life with Judy, his perspective on that experience, and about his other creative activities over the years. The Judy Room would like to thank Mr. Meyer for taking the time to respond to its questions. Your memoir Heartbreaker covers the penultimate part of Judy Garland’s life and career from the point of view of your personal involvement with her. It is meticulous in its detail, including verbatim quotes of her remarks. Your transcriptions of Judy’s speech patterns and idiosyncrasies are remarkably precise. How did you go about setting to paper her comments, and those of others, in such head-on detail? It’s hard to save someone who doesn’t want to save herself. Did you think in 1968 and 1969 that you could save Judy Garland? I sure did. That was one of the major appeals: I can be the one to save this woman where everyone else has failed. And won’t that make me a hero! I thought all I had to do was love her. And then just apply Common Sense. It wasn’t enough. So many decades later, what perspective do you have on Judy that you didn’t have when you were younger? The major insight was not about Judy, it was about myself: I was an enabler, in current terms. I fed her self-destructive impulses by getting pills for her. But if I hadn’t, she would have deserted me and found someone else to procure them – as Mickey Deans did, later. Judy was a constant; she didn’t change. I learned more in the intervening years, of course, about the causes of her emotional condition. The fact that her mom colluded with M-G-M in hooking her on uppers was a shock. What attracted you to Judy the most? Many aspects: her humor, above all. Our shared frame of reference (the early years of American popular culture) gave a great impetus to my attraction, she knew who Felix the Cat was; we spoke the same language. And, of course, her stunning intuition for how to express emotion (her acting ability, basically). And when that was applied to my own lyrics, it was almost blinding in its effect on me. Everyone who admired Judy’s immense talents was forever marked by her. How were you marked by her that is different from others? When I get to songwriter heaven I’ll track down Johnny Mercer and Lionel Bart and the other songwriters with whom she had romances… to see what they’d answer to this. Judy validated my talent. If she wanted to sing my songs, it meant they were great, that’s all. Johnny Mercer already knew. I was thrilled to hear it. Mercer wrote I Remember You for her. Did you know that? Of course you did. Did Judy ever speak to you about her past? Yes. She complained about her mother and told anecdotes about Hollywood personalities. There are many in Heartbreaker. She wasn’t much for psychological examination. For all intents and purposes, Judy was homeless when you knew her, and was living a rather vagabond existence. Did that ever seem to bother her, or you? No. We were both blinded to reality. I knew it was out there, but I thought I could outfox it by rescuing Judy, after which the world would be at our feet and the rent would no longer be a problem. Judy, at the late stage you knew her, needed a protector more than a husband. Did you realize this, and was this a heavy responsibility? I thought I could combine the two roles. At the outset I thought by loving her and applying the above-mentioned Common Sense I could make things fall into place on all fronts. Having been around showbiz, I felt I was capable of making the right career decisions for Judy from nine to five, and then from five to two A.M. it would be all laughter and lemonade. Didn’t count on Judy not getting with this program! As a writer and composer yourself, what do you think of Judy Garland’s creative legacy to classic American popular music? Triple A. Only two other figures from Judy’s era had equal impact: Fred Astaire and possibly Frank Sinatra. Astaire introduced more standards than anyone. Judy zinged in everything she sang (and acted) with a blazing intensity. That quality will allow her work to live forever. Already Wizard of Oz is a classic more powerful than any other film. And A Star is Born ain’t far behind. Judy was clearly in ill health when you knew her. Did you know what you were getting into, or was youth to blame for your love and affection for her? A blend of youth and idealism –with a touch of admiration for what she’d accomplished in the field of musicals. Not to mention her delicious humor. Might I ask you to write a few words about certain people and things in Judy’s past? Interesting case: a four-edged sword. 1) The studio nurtured and fed you; 2) Got you out of scrapes; 3) Overpaid you handsomely; 4) But shackled and imprisoned you. A golden cage. He was a contradiction: he helped Judy a great deal; without him, we wouldn’t have Star Is Born. He also took her money. He was very decent when I met him. Had a clear eye about her. Our mutual friend, Charlie Cochran, whom I respect, tells me Mickey was really a decent guy. I was at loggerheads with him initially, as Judy had deserted me for him, but he came to New York after my London debacle – and gave me additional recordings of my song, I’d Like to Hate Myself in the Morning. When you were with Judy, you often acted harshly; away from her, you could afford to be nice. I’ve lost my animosity towards him. I admire, love and respect the fans because of their passionate conviction – and loyalty to Judy. I hope they will enjoy my new novel, which features Judy in a World War Two adventure in France in the year 1943, when Judy was twenty-one. I’ve incorporated many of Judy’s real-life friends in this book, including Roger Edens, Johnny Mercer and Joseph Mankiewicz. 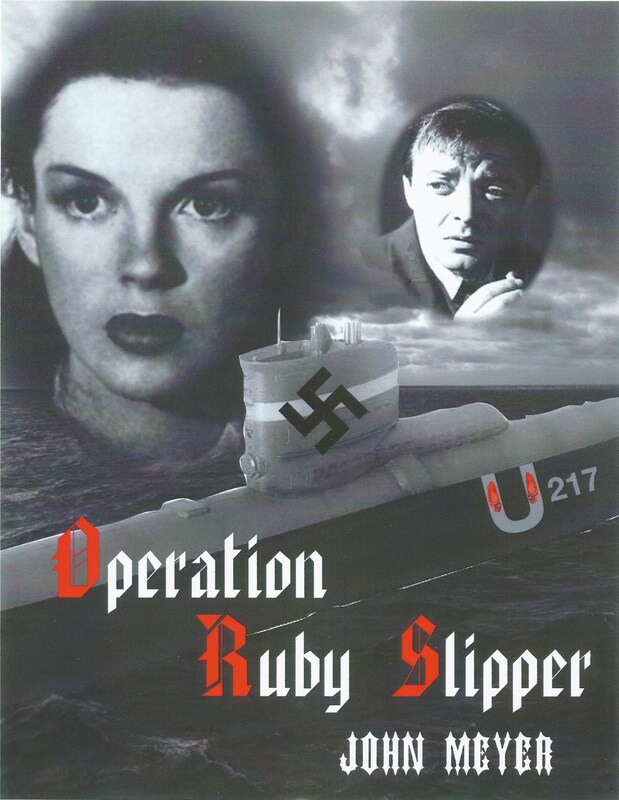 It’s called Operation Ruby Slipper, and I’m grateful for The Judy Society’s help in placing the manuscript. Judy, unfortunately, was kept from acting like a woman by her compulsions, which could override many aspects of her femininity, like tenderness. She was able to retain her maternal instincts – sporadically, but her Ritalin-induced, fragmented attention militated against the behavior we usually call Womanly. Sorry if this sounds harsh, but as Lenny Bruce says, the truth is what is. But she was always able to act womanly when performing. It’s there on the recordings and in the films for all to experience. She will live forever. You wrote the song I’d Like to Hate Myself in the Morning for Judy, and she performed it a few times in late 1968, early 1969. There is mischievousness to the song that suits her very well. Could you tell us about how the song came about? Misconception here. I had the song before I met Judy, and its ‘mischievous’ attitude is what appealed to her. She asked to learn it the very next day. She recognized I was not one of her ‘heavy furniture’ people and was willing to join her in racy repartee. I also took an obvious delight in her story-telling. The song ‘dictated’ itself to me when I got the idea of celebrating excess. Sometimes you get lucky, and originality of expression simply flows; sometimes you have to work like a demon to achieve it. Could you tell us about who John Meyer is, what his interests are, and what he has done post-Judy Garland? What are you working on now? I truly believe I was put on this earth to deliver entertainment. My passion is the musical theater, and outside of my experience with Judy, my greatest thrill was hearing the audience at the tiny Jermyn Street Theatre in London respond to my film-noir musical, The Betrayal of Nora Blake in 1998. I wrote a TV episode of the Amazing Stories series for Steven Spielberg in which George Gershwin returns from the dead to help a young composer. I recently released a CD of my songs (including Judy’s rendition of Hate Myself) now available at www.cdbaby.com. This album also features vocals by Margaret Whiting and Janis Siegel, of the Manhattan Transfer. It’s called Bringin’ Out the Beast. Currently, I have another musical thriller in the works, titled Zazou. If any of your readers are based in London, ask them to contact me! I’m also working on the novel Operation Ruby Slipper, of which the downloadable edition will be out on August 15, 2011. As I mentioned, I imagine a fictional adventure for the twenty-one year old Judy, putting her life in danger in Europe to help the Allied war effort. I’m married to a gifted and exciting woman named Suzanne. I love Burgundy wine, both red and white. And I hate long walks on the beach. Immediately following Judy’s death, what were your emotions? I was shocked but not surprised. She’d lived on the edge for so long, taking dangerous risks with her life; it had to catch up with her. I’m impatient with people who approach me with a somber, Heavy Furniture shake-of-the-head: Poor Judy, what a tragedy. Yes, the arc of her life can be seen as tragic, but on a day-to-day basis she made sure she drew to herself great bushels of music, laughter and affection. Read Heartbreaker: she was mischievous, provocative and funny. You can list the elements: her talent, her intelligence, her intuition, her unique sound, her vulnerability. Noel Coward called it star quality. How to put it in words? Goethe called the architecture of Chartres cathedral frozen music. Can we be that brilliant? See if you can come up with an equivalent phrase for Judy. Wow, great interview. He’s one of the last objective, if that is the right term, observers remaining. Great read. Thanks for all your work and for keeping it fun. I think “Heart Breaker” is a great book but he shouldn’t of written the fictional book using Judy in it. Too many people have and still are cashing in on her . Let the woman rest in peace with dignity please.